Rabat, Morocco --- 8 February 2012 ... Having won the vote of confidence in Parliament on January 31, the new, democratic Benkirane Government in Morocco convened for the first formal session on February 7. 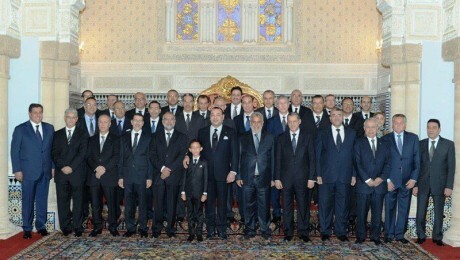 To mark the occasion, King Mohammed VI chaired the Cabinet session in the Throne Room, the Royal Palace in Rabat. The main subject on the agenda was the Finance Act of 2012. The King Mohammed VI opened the session by inquiring about the status of the crop in lieu of the cold wave and frost. The King also inquired about the precipitation rates and their impact on national agriculture in Morocco. Aziz Akhannouch, the Morocco Minister of Agriculture and Fisheries, provided a detailed survey of the situation. He emphasized that the quantities of rain to-date were good for most provinces of the Kingdom, although some crops were damaged in the southern regions. He added that weather forecast was promising. Rabat, Morocco ... 3 February 2012 ... Morocco's new Prime Minister Abdelilah Benkirane addressed the core issues of his government in the context of the Arab World's "Awakening" in an interview with the Jordanian daily As-Sabil. Benkirane stressed that Morocco has produced its own unique model of reforms that is different from the rest of the Arab World. "Moroccan officials seized early on the message of the street and responded to it in a positive way, away from any ostracism or contempt for the calls for reform. In so doing, the Kingdom of Morocco has produced its own model that is different from those followed in other countries affected by the 'Arab Spring'," Benkirane explained. All Moroccans have won, Benkirane argued, "for the population does not claim that the disruption of stability affected the activation and the pace of reform." Rabat, Morocco --- 30 January 2012 ... Shortly after his new government won the vote of confidence in Parliament, Abdelilah Benkirane left Morocco for the Economic Summit in Davos - his first and most challenging international test. On February 27, he shared the podium with Tunisia's PM Hamadi Jebali and two Egyptian presidential candidates, Abdel Moneim Aboul Fotouh and Amre Moussa, for a discussion of the future of governance in North Africa. Both Benkirane and Jebali focused on the economic challenges of the consolidation of democratic governments in their respective countries and the region as a whole. Rabat, Morocco --- 26 January 2012 ... The House of Representatives in Morocco approved today the programs of reforms and democracy of the Benkirane government as presented by the PM in his speech to Parliament. The program was adopted by a vote of 218 in favor and 135 against. No abstained votes were recorded. The session of the House of Representatives in Rabat, Morocco continued in order to enable the various parliamentary groups to explain their decision to vote both in favor and against the government program. Newly elected Prime Minister Abdelilah Benkirane opened the debate by stressing the government's commitment to taking the position of the opposition into account. Rabat, Morocco --- 21 January 2012 ... Both Houses of the Moroccan Parliament held a plenary session on Thursday, January 19, devoted to hearing Morocco's new Prime Minister Abdelilah Benkirane presenting the statement on the government's plan. The government's program is now formally presented for debate in both Houses of Parliament as the first step toward formal approval through a vote of confidence in the House of Representatives. The Speaker of the House of Representatives in Morocco formally summoned the plenary session "in accordance with Article 88 of the Constitution." Rabat, Morocco --- 21 January 2012 ... On January 19, five young Moroccans set themselves on fire near a building of the Morocco Ministry of Education in Rabat. The five were saved by passersby, but three had to be hospitalized. They were part of widespread demonstrations all over Morocco protesting unemployment, especially among university graduates. One of the young people who set himself on fire explained that he wanted to focus attention on the plight and desperation of the young unemployed. The leftist opposition daily Libération commented in an Editorial that the self-immolation was attempted in order "to protest against delays or indifference in the treatment of their case despite the commitment of the new Benkirane government." These five young men put a human face on one of the greatest challenges facing Moroccan society - and not just the incoming Abdelillah Benkirane government. Rabat, Morocco --- January 18, 2012 ... The new Benkirane government in Morocco is moving prudently towards assuming power. Formally, the government still has to await the vote of confidence for the government and its programs by the House of Representatives. In the interim, ministers are studying their new fields of action without permission to engage in actual decision making. Almost all the new ministers in Morocco are in the process of learning their new roles. They conduct meetings with all of their secretariats and senior staff, as well as directors of central and regional services. Rabat, Morocco --- January 18, 2012 ... During the election campaign in Morocco, Prime Minister Benkirane had repeatedly promised that the fight against corruption would be a high priority for his new government. Now, the Benkirane government has begun to make good on this promise and embarked on a major anti-corruption campaign. At the instructions of Benkirane, Morocco's Central Agency for the Prevention of Corruption (ICPC) is preparing a document with "priority" proposals how to strengthen the fight against corruption in the Kingdom. The ICPC President Abdeslam Aboudrar pointed out that the ICPC is preparing for a major transformation. With a new priority status, the ICPC is gearing up for a major surge in order to bolster the campaign against corruption in Morocco. Rabat, Morocco --- January 10, 2012 ... After a weekend of well-earned relaxation, the members of Morocco's new government are starting to work. There are huge expectations at the grassroots which the new government in Morocco must now meet. For about two thirds of the cabinet ministers and minister delegates this is their first experience in government. Most of them have managerial and or academic expertise in the issues handled by their respective ministries. However, they lack the political experience which can be a huge benefit for launching reforms and enhancing democracy, but also a hindrance in getting programs implemented by the multi-layered government and regional bureaucracies. Morocco Prime Minister Abdelilah Benkirane is convinced that the cabinet's commitment to reform and democracy should override all other considerations. "This new government has a true will for reform and we will keep all the promises we made," he said. Rabat, Morocco --- January 04, 2012 ... As a quintessential element of their coalition forming, the General Secretaries of the four parties in Morocco, Abdelilah Benkirane, Abbas El Fassi, Mohand Laenser and Nabil Benabdallah, jointly signed on December 16, 2011, a landmark document in the history of Moroccan politics: "The Charter of the Majority". The Charter is a contractual document that defines the scope of the joint action of the coalition's partners and the basic principles of their government's democratic program. With the swearing in of the new government by King Mohammed VI on January 3, 2012, the Charter of the Majority becomes a legal document of immense importance for it outlines and articulates the Benkirane government's program and modus operandi. Rabat, Morocco --- January 3, 2012 ... After thirty-five days of arduous negotiations, Morocco has a new government. 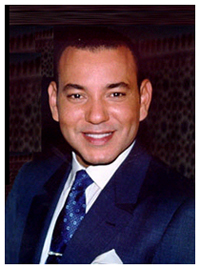 On January 3, 2012, Abdelilah Benkirane presented his selected ministers to King Mohammed VI for royal approval and swearing in. The ceremony took place in the Throne Room at the Royal Palace in Rabat. The lengthy process of coalition negotiations and government forming in Morocco is bound to have tangible impact on the performance of both the government and PM Abdelilah Benkirane. There are huge expectations from the new government at the grassroots level. Rabat, Morocco --- January 3, 2011 ... King Mohammed of Morocco today appointed members of a new, diverse and democratic Cabinet. The Cabinet will be led by the Islamist Justice and Development Party ( PJD) leader and prime minister-designate Abdelilah Benkirane. Rabat, Morocco --- January 3, 2012 ... Cognizant of the growing impatience in the public and media, Morocco's PM-designate Abdelilah Benkirane sought to calm down the doubters about the progress in the coalition negotiations toward the composition of his government. Addressing a Party meeting in Rabat, Morocco, Benkirane reiterated that he was "optimistic" about the formation process of the new Cabinet. Benkirane explained that the government forming process in Morocco was taking so long because it is a precedent-setting undertaking that, in view of the historic significance of the implementation of the new Constitution, involves the entire Moroccan nation and not just the leaders of the four parties of the coalition. Rabat, Morocco --- December 28, 2011 ... As anticipated, the recently appointed Prime Minister of Morocco, Abdelillah Benkirane and his coalition partners - Abbas El Fassi, Nabil Benabdallah and Mohand Laenser - are discovering the complexities and length of meaningful, democratic, coalition and government forming negotiations. Although their reaching of agreement on joint policies toward the key economic and democratic issues facing Morocco was indeed the main and most important challenge to be met, addressing and resolving the precise personnel issues are far more multi-faceted and thus lengthy undertakings. And herein the Moroccan coalition negotiations are snarled. Rabat, Morocco --- December 25, 2011 ... On Saturday morning, December 24, Morocco’s Prime Minister Abdelilah Benkirane announced that major progress had been achieved in the coalition negotiations and that the specific ministerial portfolios to be allocated to the coalition’s four parties would be unveiled within the next couple of days. 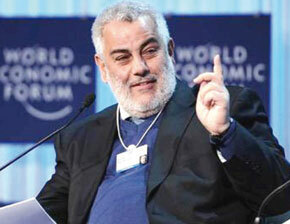 “The question of allocation of portfolios should be resolved in one or two days,” Benkirane said. The new Prime Minister of Morocco said that he expects the pace of negotiations to accelerate because “things are more clear” for the other three coalition parties. He plans to soon name “the eligible candidates for the portfolios” for the next government. Rabat, Morocco --- December 22, 2011 ... On December 20, the new coalition in Morocco elected Karim Ghellab of the Independence Party as Speaker of the House of Representatives for the term of 2011-2016. In his acceptance speech, Ghellab pledged “to put the Moroccan citizens’ concerns and expectations at the center” of the House’s action. The coalition negotiators failed to meet the December 20, 2011 deadline they had hoped to achieve. Back on December 17, the eight members of the Commission responsible for developing the government’s joint program reported to the four party leaders in Morocco that they were hoping to form a government as early as December 20. Rabat, Morocco --- December 16, 2011 ... On the evening of December 16, Morocco took another major step toward the forming of the new coalition government. The leaders of the four parties of the Coalition - Abdelillah Benkirane, Abbas El Fassi, Nabil Benabdallah and Mohand Laenser - signed in Rabat the Charter of the Majority. Benkirane defined the document as a "contract between the components of the next governing majority." After the signing ceremony in Morocco, Benkirane said that with the signing ceremony, the four majority parties committed to "a common Charter and the structure of the new government." The Charter of the Majority constitutes a major step forward in Morocco's grappling with the ramifications of the significantly greater authority of the next government as mandated by the new Constitution. Rabat, Morocco --- December 14, 2011... Morocco’s designated next Prime Minister - Abdelilah Benkirane - continued on the path to democracy by conducting coalition building negotiations and consultations. Earlier this week he met with the Secretaries General of his main coalition partners - Abbas El-Fassi (the current Prime Minister) of the Independence Party, Mohand Laenser of the Popular Movement, and Nabil Benabdellah of the Party of Progress and Socialism. Rabat, Morocco --- December 13, 2011 ... Over the weekend, the governing bodies of the three parties interested in joining the coalition in Morocco with Benkirane’s Justice and Development Party formally decided to join the government. On Sunday, the National Council of the Independence Party and the National Council of the Popular Movement both unanimously approved the decision to participate in the upcoming government. Moreover, the Central Committee of the Progress and Socialism Party also approved by a large majority the decision to join the Benkirane government. These decisions mean that the forthcoming government will have from the start a comfortable majority of 217 seats (55 percent of the votes) - a profound improvement over the narrow 199-seat (50 percent) government Benkirane had been anticipating late last week. Rabat, Morocco --- December 10, 2011 ....Abdelilah Benkirane, Morocco’s next Prime Minister, decided to expedite the formation of his new government by immediately forming a narrow, small majority government. This way, it would be possible to begin implementing the new Constitution and the new good governance socio-economic policies immediately. The new government’s focus on domestic issues was clearly stated. “Social issues will be given priority by the incoming government in Morocco, which will put emphasis on the sectors of education, health, employment, housing and justice,” Benkirane told a gathering of political leaders. Rabat, Morocco --- December 10, 2011 .... Abdelilah Benkirane, Morocco's first Islamist prime minister said on Friday that his democratic government would not try to make women dress more modestly. 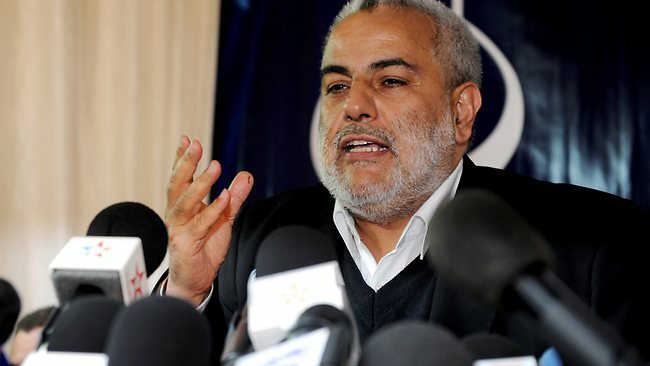 Abdelilah Benkirane is to lead a coalition government in Morocco after his Justice and Development Party (PJD) became the latest Islamist movement in the Mid East to win an election in the wake of the "Arab Spring" revolutions. The party is anxious to reassure powerful secularists in the Morocco establishment, foreign investors, and the tourists who provide much of the country's revenue, that it will not try to impose a strict Muslim moral code. Rabat, Morocco --- December 5 ... On November 30, King Mohammed VI formally appointed Abdelilah Benkirane, the leader of the winning Justice and Development Party, as Morocco's next Prime Minister in accordance with the provisions of the new Constitution. The King noted that he was following the new constitutional guidelines requiring the Monarch to choose a Prime Minister from the party which won the largest number of seats in the Parliament. Benkirane reiterated his fealty to the throne and stressed his commitment to follow the Constitution and keep Morocco online with the King's reforms process. Rabat, Morocco --- November 30, 2011 ... The main challenge facing the Moroccan political system was the prospect of voter apathy. In the 2009 local and regional elections, turnout was 37 percent. In urban slums and remote villages, economically poorer elements of society told pollsters that "they did not plan to cast their ballots because they had no faith that legislators would work to improve their lives". Rabat, Morocco --- November 28, 2011 ...The final results of Morocco's parliamentary elections were released on November 27. Together with assessments based on the parties' own political studies - these results constitute a sound base for analysis of what to expect next on the Moroccan political scene. The two key factors in the results concern the relative powers of the leading parties. Rabat, Morocco --- November 28, 2011... The International Strategic Studies Association (ISSA)1deployed a team of experienced election monitors to key areas throughout the Kingdom of Morocco to monitor the conduct of the November 25, 2011, Parliamentary elections, which followed the guidelines laid down in the new Constitution of the Kingdom, approved overwhelmingly by the July 2011 Referendum. Rabat, Morocco --- November 26, 2011 ... 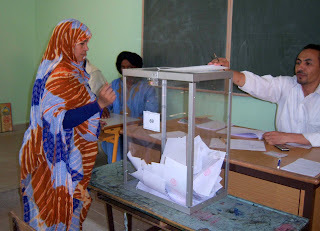 Initial results, as announced by Morocco Interior Minister Taieb Cherqaoui, indicate that voters’ turnout in the 2011 parliamentary elections stood at around 45% nationwide. This turnout thus exceeds the magic 37% of the 2007 parliamentary elections. Data collected and analyzed by the Moroccan Interior Ministry pointed out to a building voters’ momentum toward the closing of the elections. Voting started slow. By noontime, voter turnout stood at 11.5%. However, by 3pm (15:00 GMT) , voter turnout stood at 22.4%, and at 5 p.m. (17:00 GMT), voter turnout reached 34%. By 7 p.m. (19:00 GMT) when the polling stations closed down, the voters’ turnout stood at 45%. The voters’ turnout, while still below the 50% mark, does point to a growing confidence in the role of parliament and democracy in charting the nation’s course. ..
Rabat, Morocco --- November 24, 2011 ... With the Middle East in many areas in political flames, Morocco is doggedly pursuing its evolutionary yet dramatic governance reform process which ranges from giving more self-rule authority to the country’s diverse regions to profound Constitutional reforms aimed to adapt to the changing times. Rabat, Morocco --- November 22, 2011 ..... 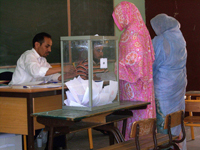 The November 25, 2011, parliamentary elections constitute a historic turning point in Morocco's evolution into a Western-style Constitutional Monarchy. Morocco has been undergoing a process of democratization and governance modernization since the mid-1999 ascent to the throne of King Mohammed VI. The November 25, 2011, parliamentary elections will be the first conducted in accordance with the just ratified new Constitution. Moroccan King Muhammad VI has led the way to several democratic reforms.